In September 2011 I was weeding along the riverbank and in the space of a couple of hours I saw a coucal sitting at the top of a dead tree, a white heron wading along the river’s edge and an eastern water dragon lying on a fallen log. I could hear tiny pardalotes singing, the usual background of crows carking and bursts of sqwarking from channel-billed cuckoos. After 8 years of being on this 10 acre property a number of factors have come together so that we are noticing an increase in numbers and diversity of wildlife. When we first moved here there was not an abundance of native fauna. The riverbank was so infested with weeds that it was inaccessible, the land mostly served as grazing for a couple of horses and three large dogs were left to roam at night. The wildlife mostly consisted of fauna we had already encountered in suburban Brisbane – the usual contingent of possums, crows, ibis, kookaburras, koels, noisy miners, native frogs, parrots, crested pigeons and flying foxes. There were a few additions such as cattle egret, butcher birds, mud wasps, native ducks, blue-faced honeyeaters and bandicoots. Unfortunately there were also cane-toads, hares, ticks and the occasional fox. The most dramatic occurrence of wildlife would happen in early spring when channel-billed cuckoos would migrate from the north to feed on the large fig trees on our property. During the drought years this wildlife was resident in limited numbers and we installed a dam and partially restored the riverbank to native vegetation (with the removal of weeds such as lantana, blackberries, asparagus fern, glycine, balloon vines). We only decided to join Land For Wildlife eighteen months ago but the new knowledge and motivation we have gained from this partnership, our continued planting of many natives and the wonderful return of rain have shown that this land can support an even greater array and number of animals. We have sighted and heard coucals nesting in long grass near the river; the quail population has exploded in our garden beds; there are some whipbirds calling in our gully in the afternoons; an echidna has taken up residence in one of our bush gardens that is watered by a septic system; the bearded dragon along the driveway is still seen occasionally in spite of its camouflage; a family of little grebes have joined the other native wood ducks that use our dam as a base; cormorants are sometimes aloft on the pole in our dam; flocks of parrots have come to feed on flowering bushes and trees; crested pigeons, turtle-doves, a pair of lapwings, butcher birds, noisy miners and a stone-curlew have made nests for their young around the house; we have been startled by large red-bellied black snakes and green tree snakes slithering away; a dozen sulphur-crested cockatoos have called in to feast on fallen macadamia nuts; we have seen a carpet python climbing a tree in our bush garden while birds darted and squealed; we have found evidence of tawny frogmouth owls, sugar gliders and water rats.To join this menagerie we have also installed a hive of native bees under our verandah eave. It is such a thrill to discover all this wildlife and we are constantly going to references to check on identification. We still need to become more expert at photographing this wildlife as well as learning more about insects – wildlife seems to be an ever-expanding realm whereas once we would have thought of ‘native wildlife’ in terms of larger well-known animals. Admittedly we still hanker after a koala or two in one of our riverside trees! My apologies for lumping ‘hares’ into the group of introduced species that have gone rampant in their breeding. 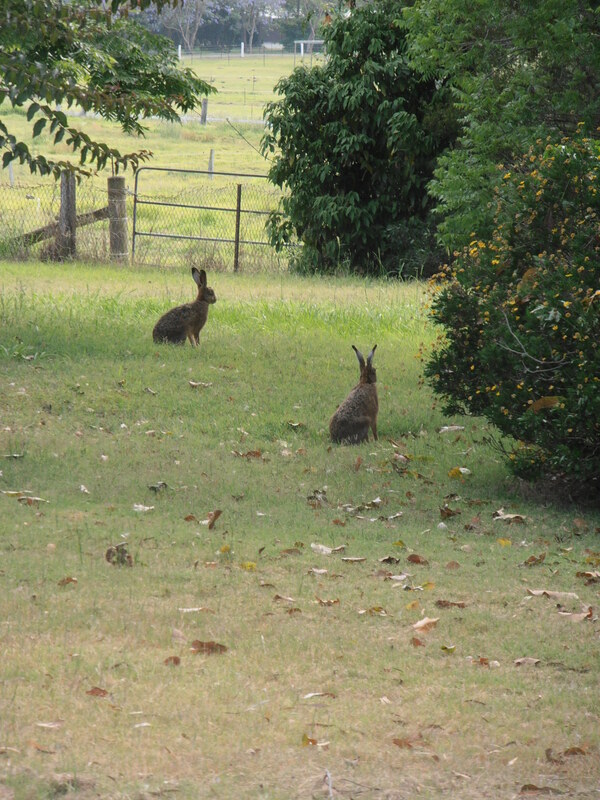 In the April 2012 edition of The Local Bulletin (Western Suburbs, Brisbane) in the column ‘Creature Corner’, Lydia writes that hares are ‘quite a benign import’. A vet had informed her that hares are not listed on the Department of Environment & Resource Management website as pests, unlike rabbits.